You may locate all of your devices in the same place, or you may have several places such as a shop, a mall, etc. 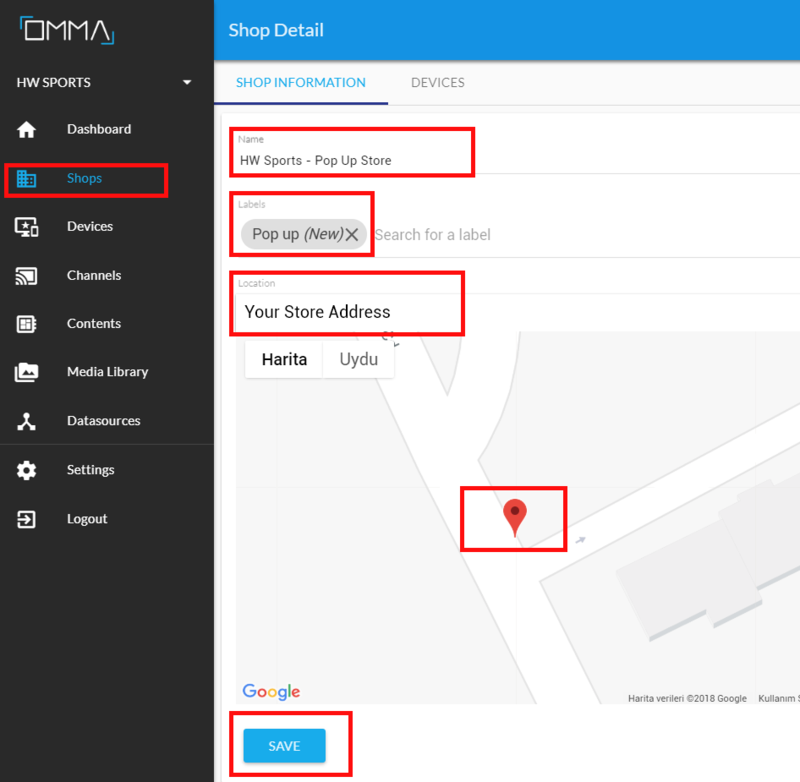 These places are called Shops in OMMA console. They are basically used to group the devices that are located closely at a certain place. As an example, you may have 2 shops as A and B, and 8 devices in total. After you create your shops in the console, for devices 1 to 5, you select their shop as Shop A. You mark the shop of devices 6-7-8 as Shop B. By this way, you can easily list and control your devices. Before configuring a device, you need to define at least one shop. Now let's create your first shop. How do I create a Shop? Click on Create Shop button. Enter a name for your shop. Label field is optional and for advanced uses. You can skip this field for now, or visit Shop Labels to examine what labels are used for. On the location field, enter the location of the shops and select from the suggestions. Then put a pin on the map to indicate the exact location of your shop. You should be redirected to the Shops page and see a green notification at the bottom right of the page, indicating process is a success.